Management Reviews Recalls & Field Action Mgmt. We provide high-caliber, FDA Compliance Specialists with 15+ years of regulated industry auditing experience; we provide a cost-effective, fixed price audit for each audit we support; our fixed price audit includes: pre-audit preparation; audit planning; travel time (U.S. only); the audit itself; daily audit debriefs; the final audit report with one review cycle; and we assign a dedicated U.S. based audit administrator for every audit we support. Outsource our highly experienced auditors today! 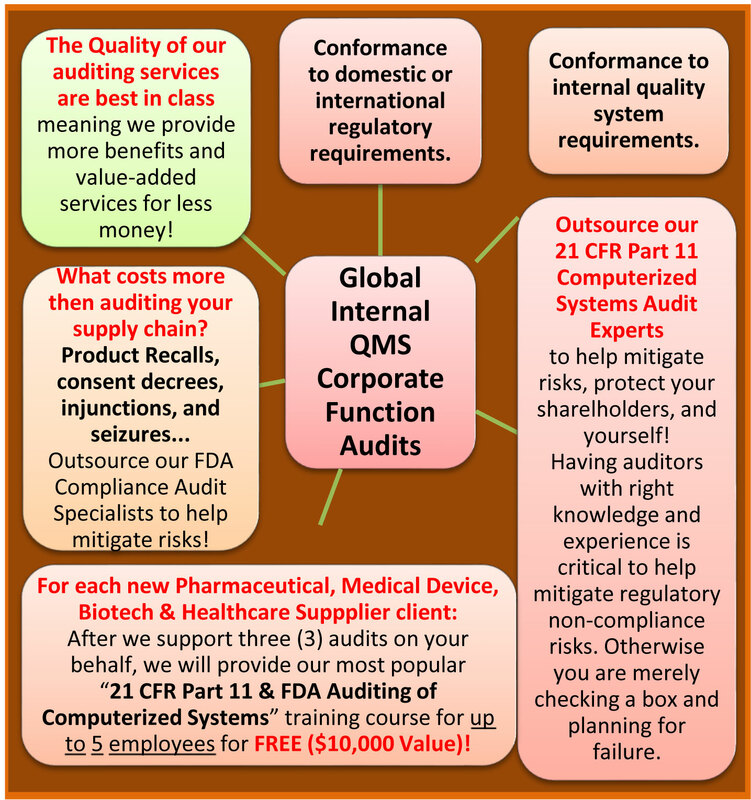 For each new Pharmaceutical, Medical Device, Biotechnology, and Healthcare Supplier client - After we support three (3) audits on your behalf, we will provide our most popular "21 CFR Part 11 & FDA Auditing of Computerized Systems" online training class for up to 5 employees for FREE ($10,000 value)!